Guillaume, de Lorris, and Jean Meun. 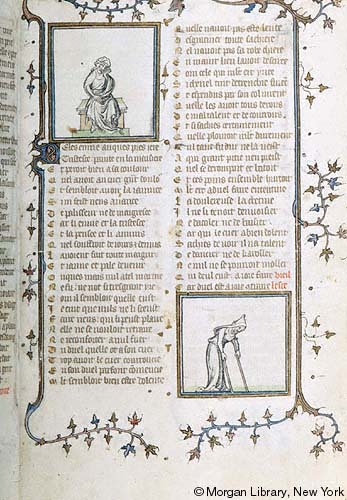 Roman de la rose. Illuminated manuscript. Paris, c. 1380. 189 leaves. Morris showed the manuscript to friends at dinner on 4 July 1895 (Cockerell diary). Provenance: Iohannes Marous (Jean Marot?). — Pierre Vischer (purchased in 1773). — Baron de Neubourg. — de Neubourg sale, Merlin (Paris), 4 November 1839, lot 591. — G. Libri. — Libri sale, Victor Tilliard (Paris), 12 April 1855, lot 1815. — Ambroise Firmin-Didot. — Firmin-Didot sale, Hôtel Drouot (Paris), 6 July 1878, lot 34 (sold to Quaritch). — Quaritch catalogue, December 1878, no. 9. — Quaritch catalogue, 1880, no. 15265. — Quaritch catalogue 332, November 1880, no. 32 (£480). — Quaritch catalogue, 27 February 1882, lot 49. — Quaritch catalogue 369, September 1886, no. 35709 (£480). — Quaritch catalogue 103, April 1890, no. 361 (£480). — Quaritch catalogue 138, December 1893, no. 42 (sold to Morris, 20 June 1895). — Morris. — Richard Bennett. — J. Pierpont Morgan. — Morgan Library (MS M.132). References: Additional bibliography (Morgan). — Curatorial description (Morgan). — de Ricci, 2:1391, no. 132. — Ellis valuation, fol. 6, no. 91 (£250). — Morgan Catalogue 4, no. 112. — Schoenberg (SDBM_MS_7313).